Wal-Mart‘s “Cyber Monday” deals are really a post-Thanksgiving week-long sale on 51 select items ranging from cookies, to toys, to DVDs. 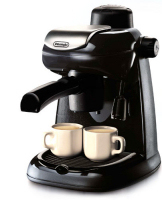 Looking through the list, we’re drawn to the DeLonghi Steam Cappuccino Espresso Machine for only $39.87, which would go well with the Starbucks Holiday Favorites for $18.22. You can pick up 3 PS2 or Xbox games (from a select list, of course) for only $25. As for gadgets and electronics, there’s a Visco 37″ Widescreen LCD HDTV for $798, a Philips 3 Megapixel Retro Style Ultra Digital Camera for a mere $49, a Kodak 5 Megapixel EasyShare V570 Dual Lens Digital Camera for $218, and a Garmin StreetPilot i5 GPS for $289. Take a look and see if anything sparks your interest.